There were some quirky weather events this morning. 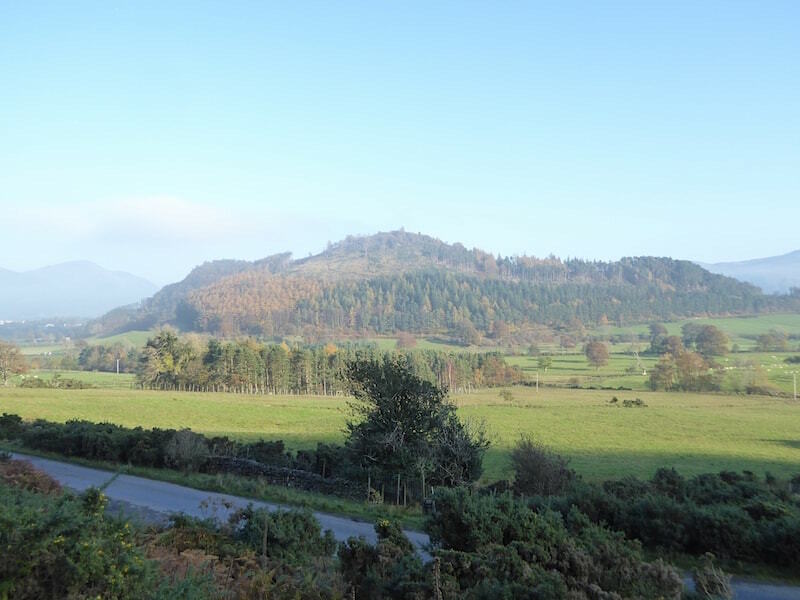 The conditions along the A66 to Braithwaite alternated between dense and gloomy fog patches, where you could barely see the road in front of you, and blazing sunshine, which had you reaching for the sunglasses. 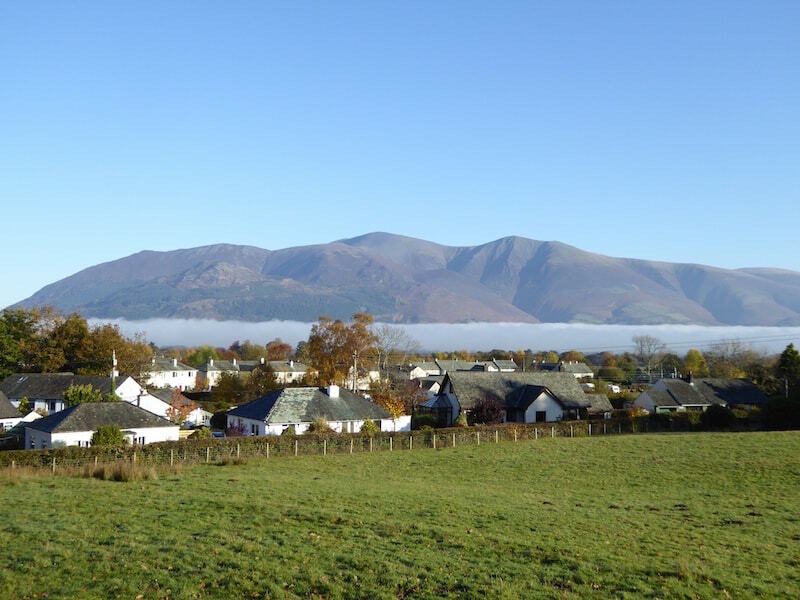 Braithwaite village itself was clear of fog but from our parking spot I noticed this low lying inversion covering the vale of Keswick. 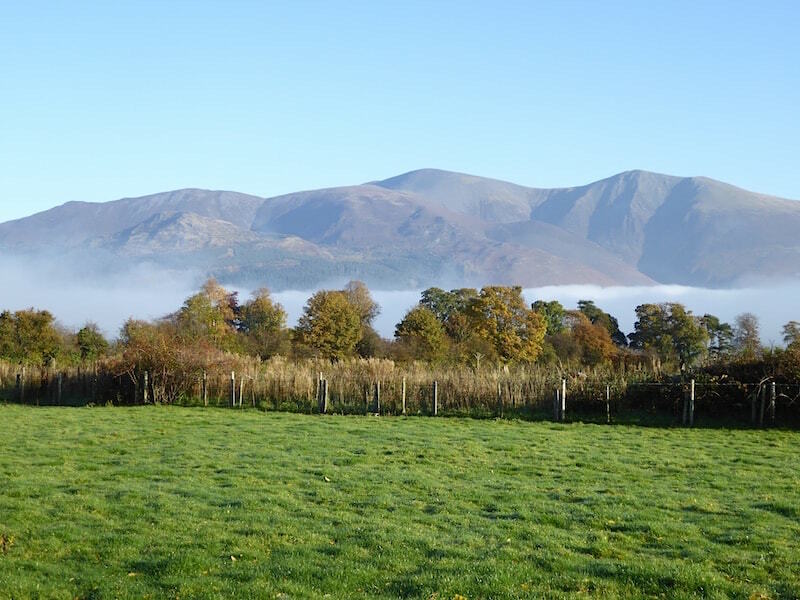 This is looking over at Skiddaw, on the centre skyline, and Skiddaw Little Man to the right of it, from Braithwaite village, with the inversion looking like the filling in a sandwich. 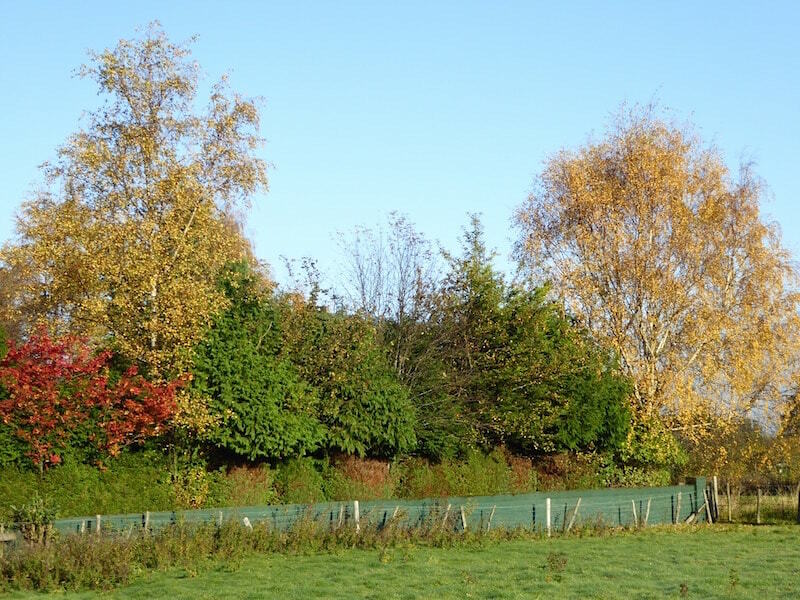 As you can see there’s not a cloud in the sky, a beautiful morning for a walk. 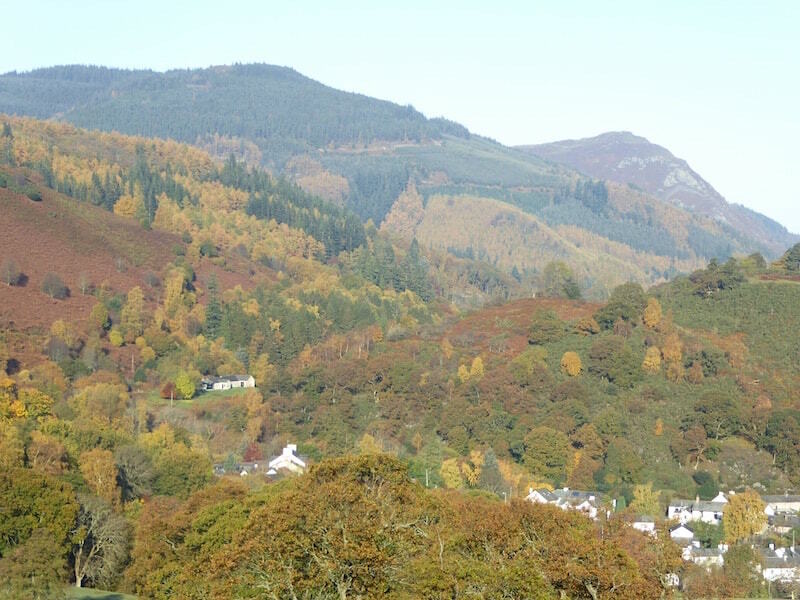 The autumn colours are fabulous just now, and much better than last year when a series of strong winds blew the leaves off before they had a chance to really put on a good show. 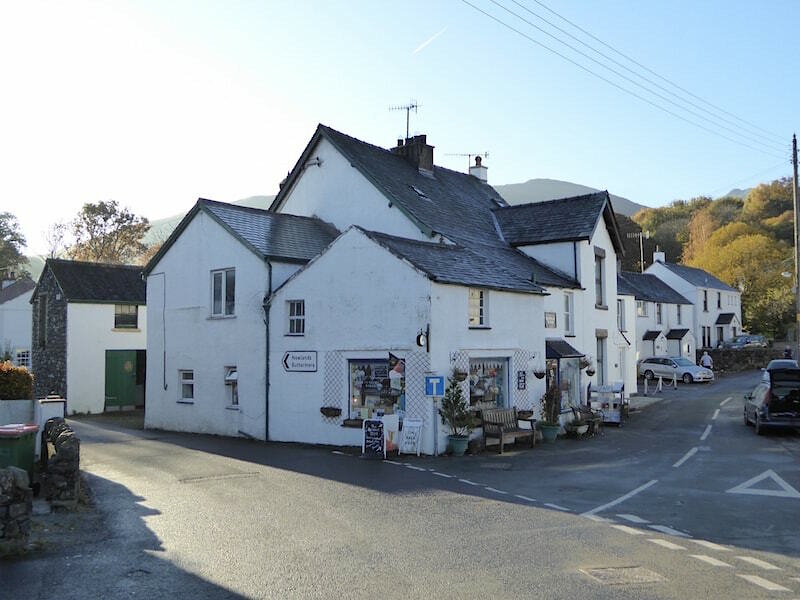 Passing through Braithwaite village. The main holiday season is over so there was hardly anyone around. 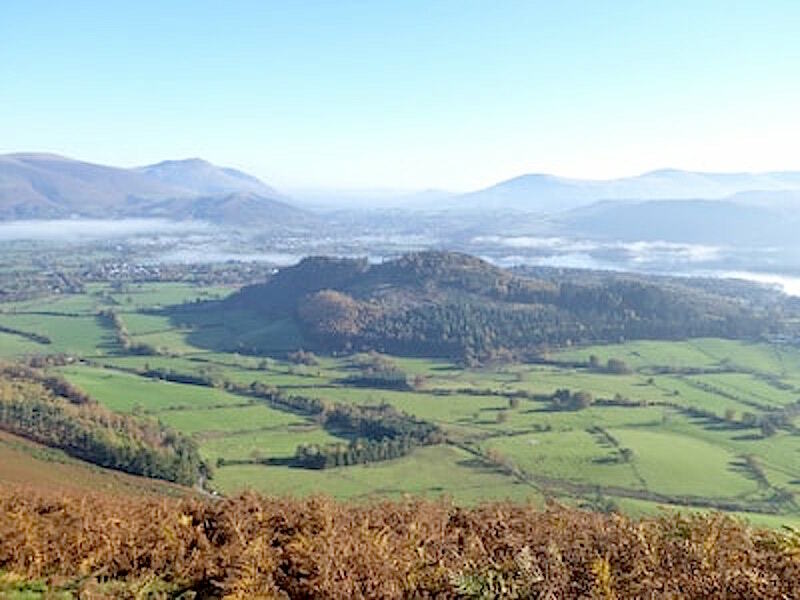 We’ve gained a little height as we walk up to Braithwaite Lodge, so I take a look back over the village, and the inversion, to the Skiddaw fells. 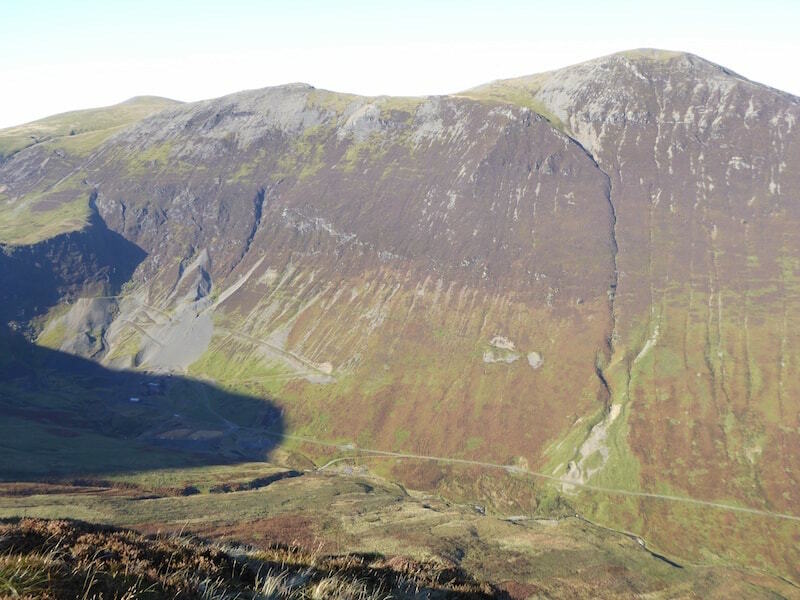 Colourful fell sides below Barf which is over there on the right skyline. 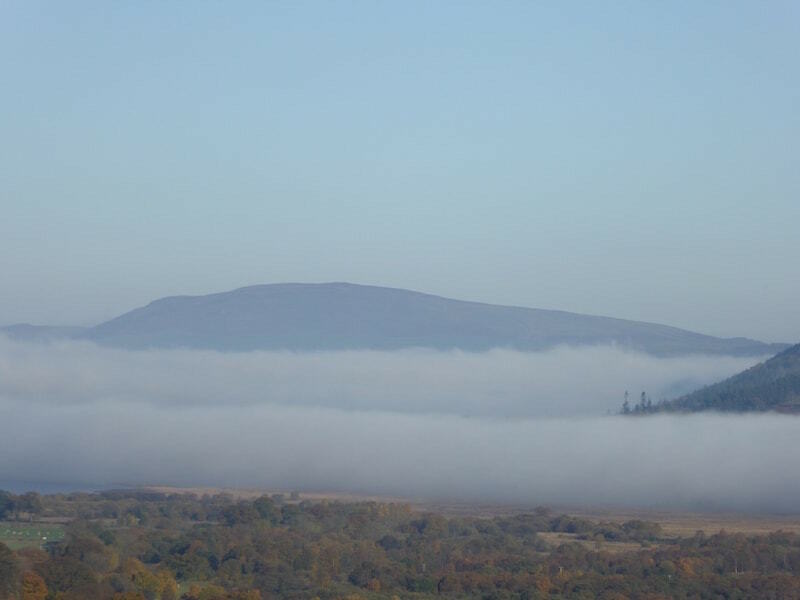 A close up of distant Binsey sticking up above the inversion. 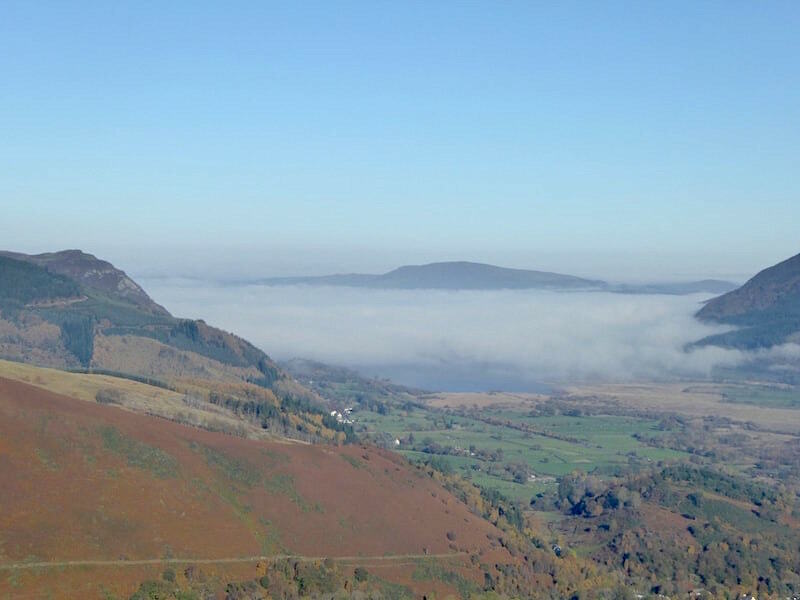 The inversion covering the vale of Keswick. 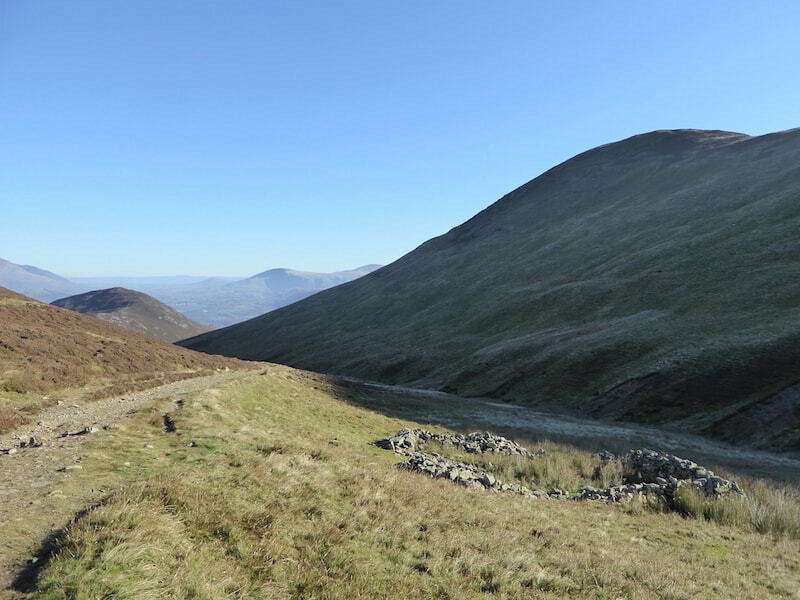 Looking ahead to Barrow summit, on the left, with the Coledale fells over on the right. 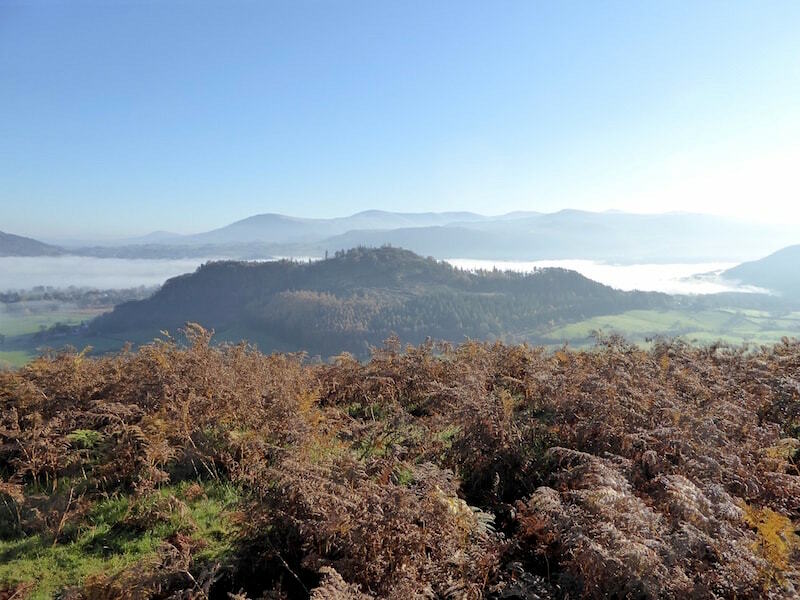 Looking over Swinside Knott towards the Eastern fells, Keswick and Derwentwater are somewhere there under the inverson. 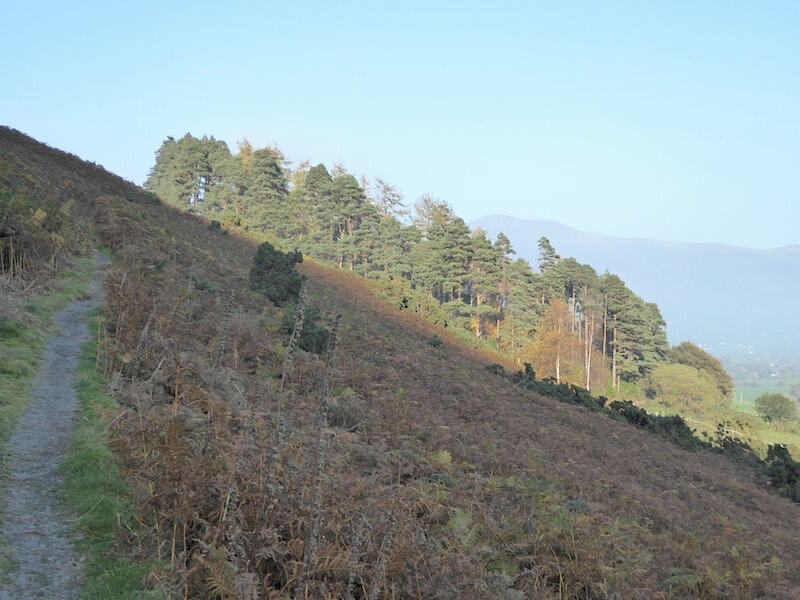 We carry on along the path and reach the point where, having gained height, it now has to be lost and then regained. Oh well, its only a small drop down. 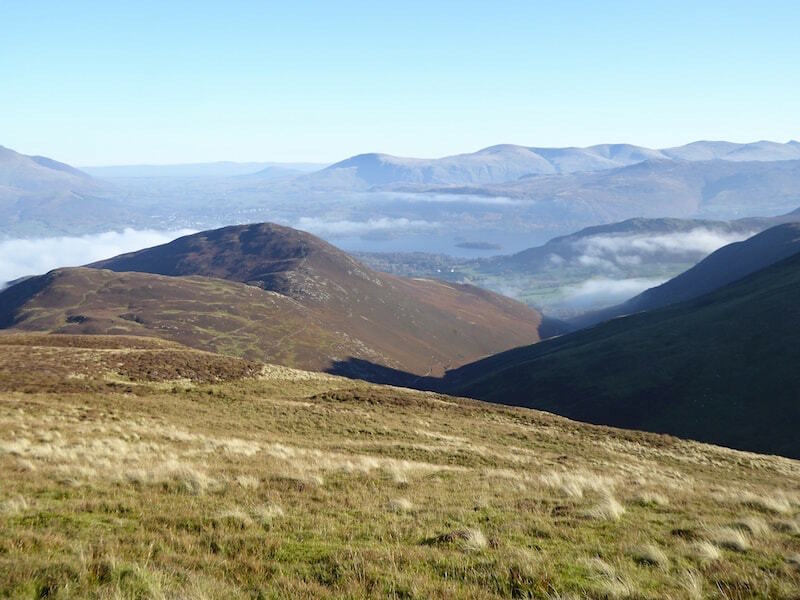 Looking back at our route up Barrow, the inversion is thinning out over there. 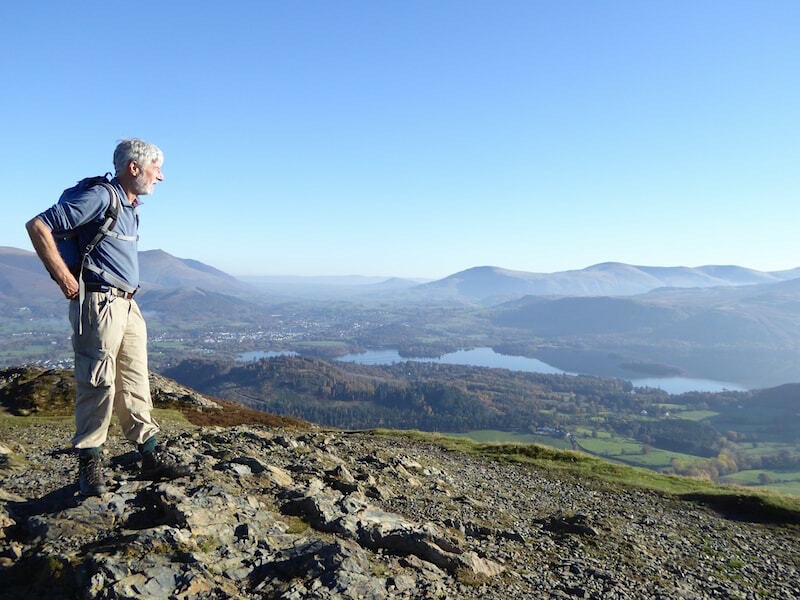 As we climb I keep glancing across to see how things are progressing, going ….. 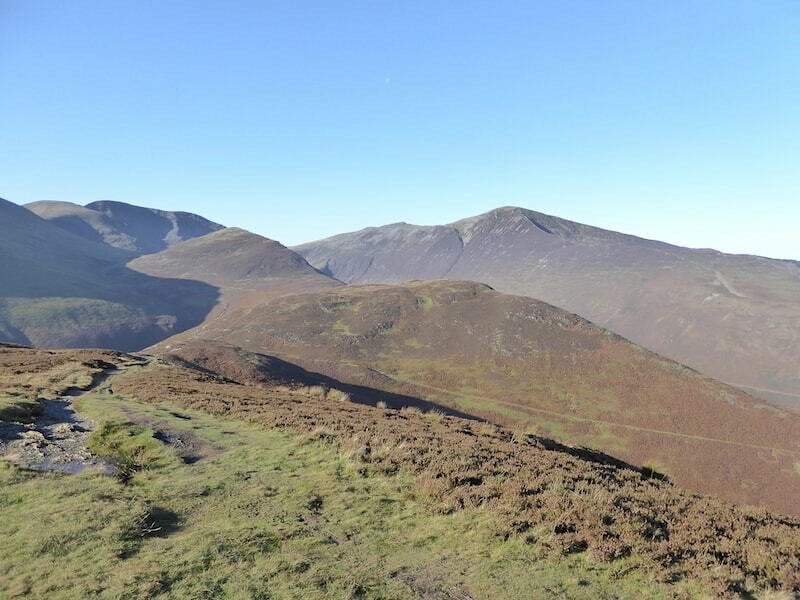 The knobbly top of Causey Pike from Barrow summit. Views to the south were difficult to get today as the sunlight was so strong. 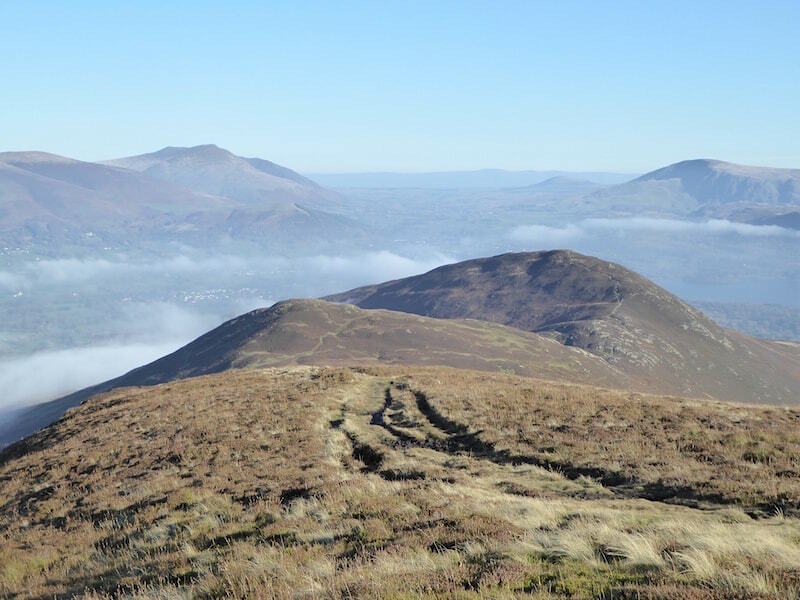 On the skyline over to the right is Grisedale Pike, the conical shaped fell just to the left of it is Outerside, and that’s where we are off to next. 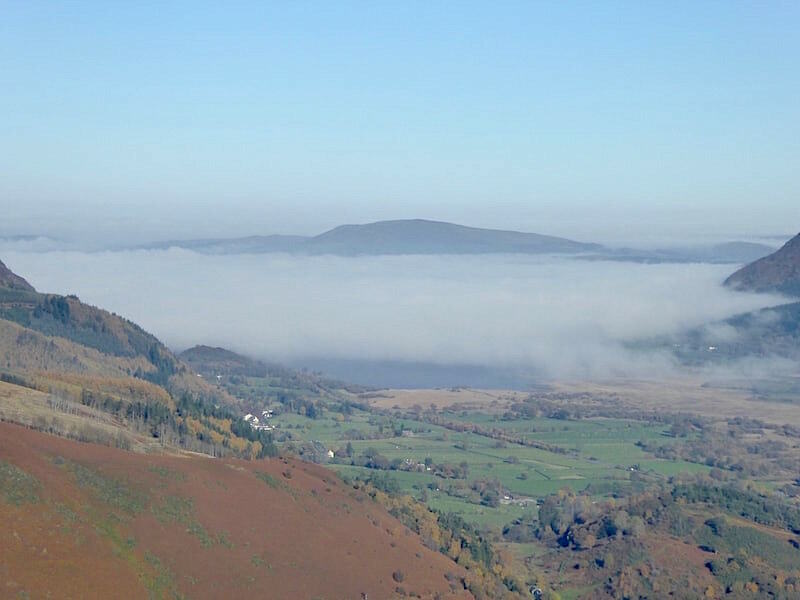 Looking over to Binsey again and it looks like the inversion is beginning to build once more. 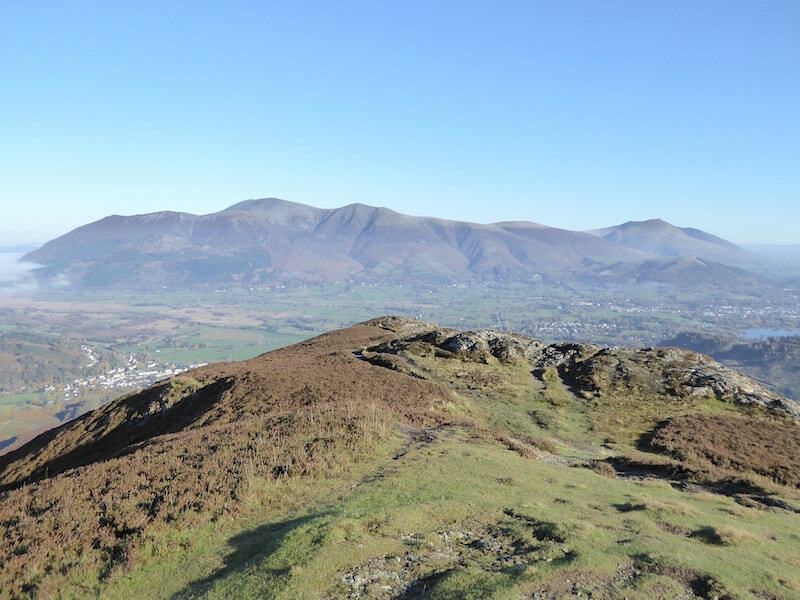 On Barrow summit and all is now clear over Keswick and Derwentwater. 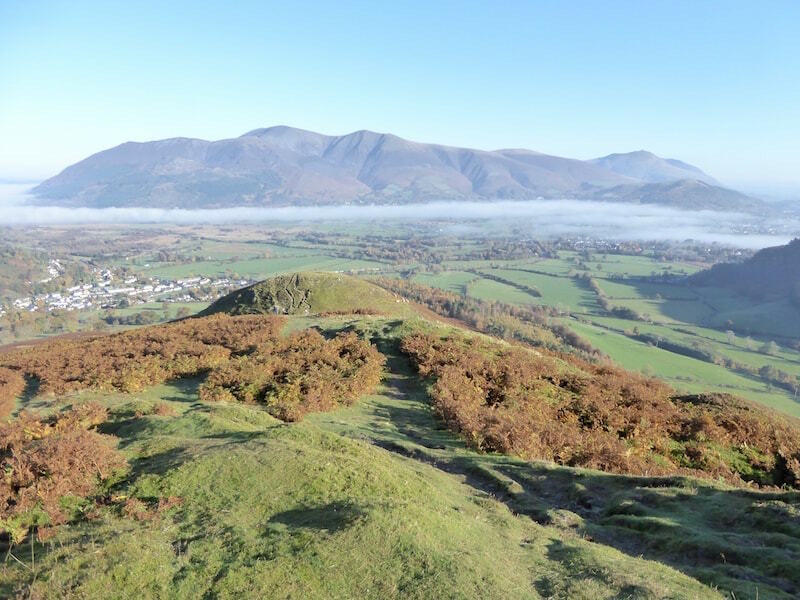 The vale below the Skiddaw fells is clear at the moment, but keep an eye on that inversion over to the left …..
….. because its definitely starting to creep in again. 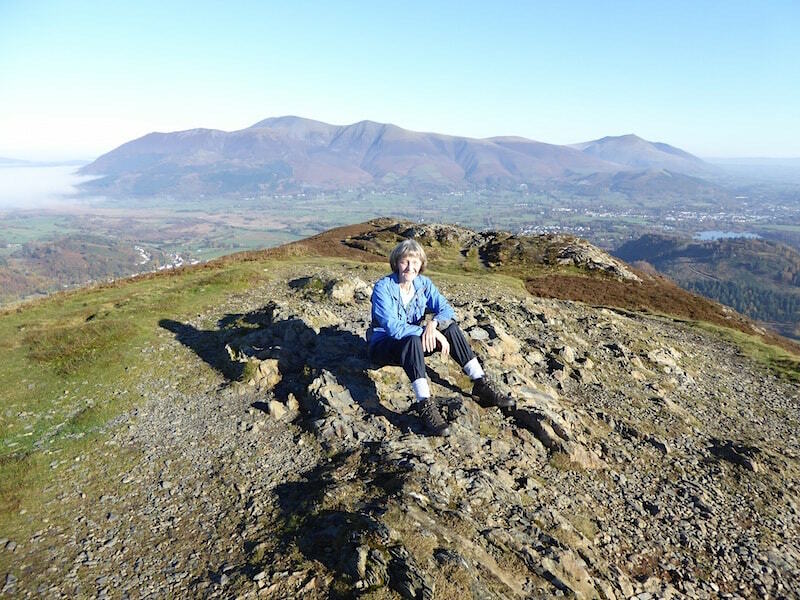 Enjoying the sunshine on Barrow summit. No sign of this dissipating any time soon. 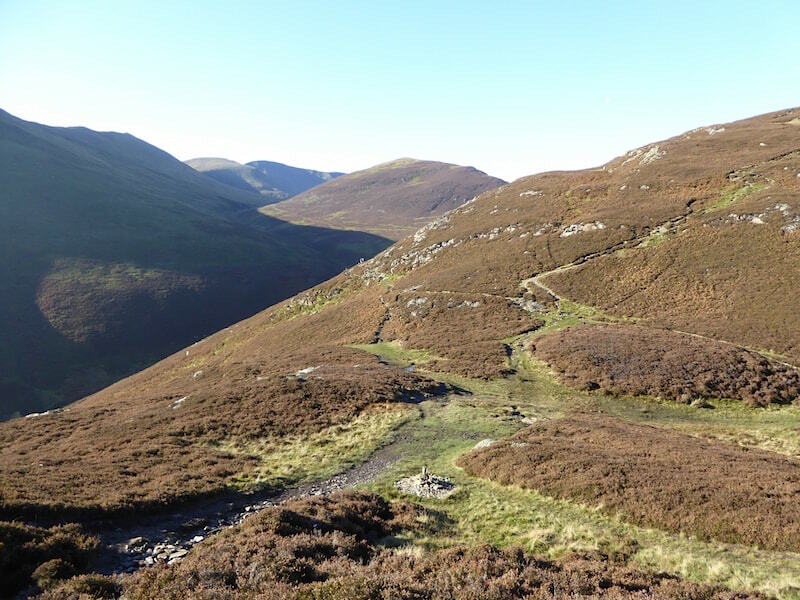 We’ve walked down from Barrow to this path junction where there’s a choice of routes, left for Stoneycroft Gill, up to the right for Stile End, and straight ahead for Outerside, that’s the fell which is smack in the middle. A close up of Outerside. 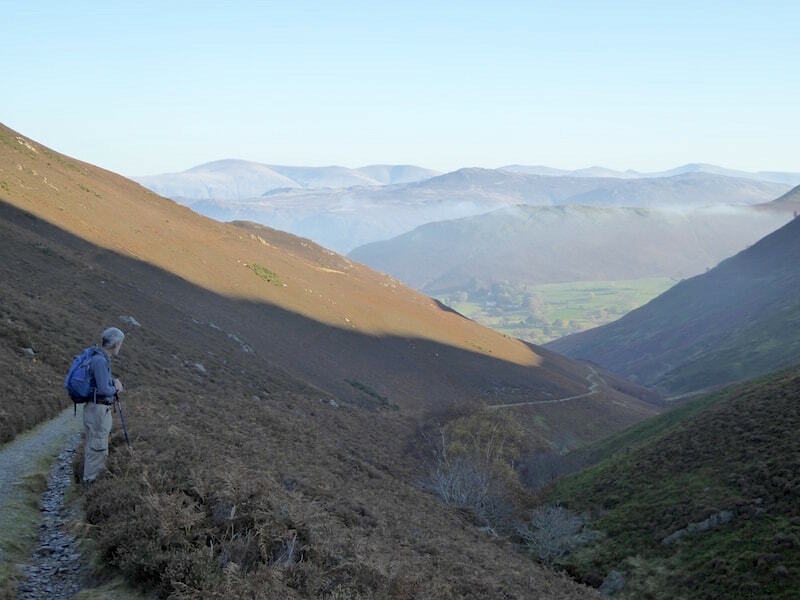 On the path to Outerside and looking back at Barrow, on the left, and the layers of fells to the east on the skyline. The old sheepfold alongside Stoneycroft Gill. Around this point we turned off to the right of the path to walk on to Outerside. 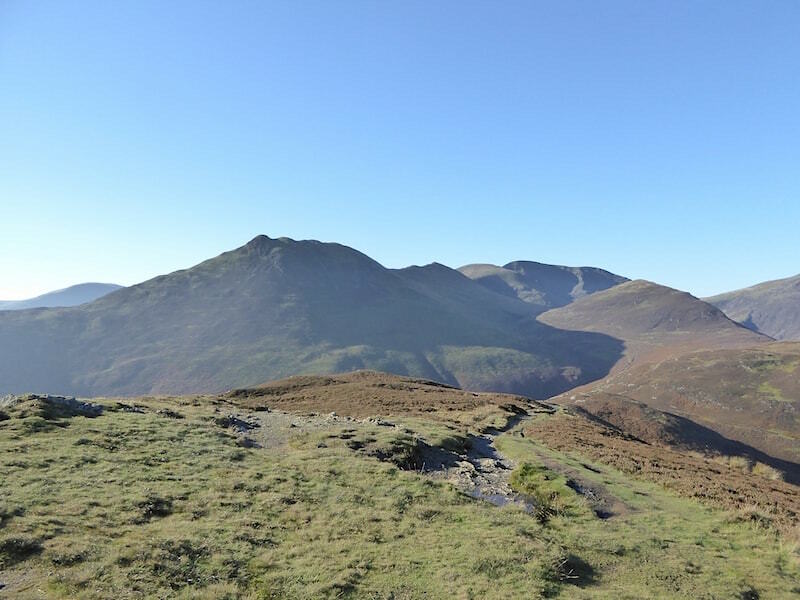 The fell in the shade on the right is Causey Pike. 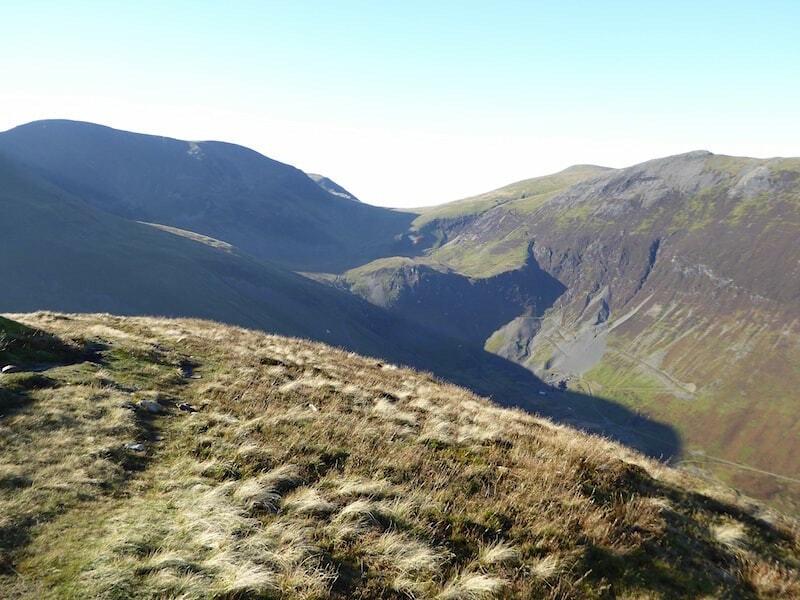 From Outerside a view across Coledale to Grisedale Pike, with Hopegill Head over on the far left. 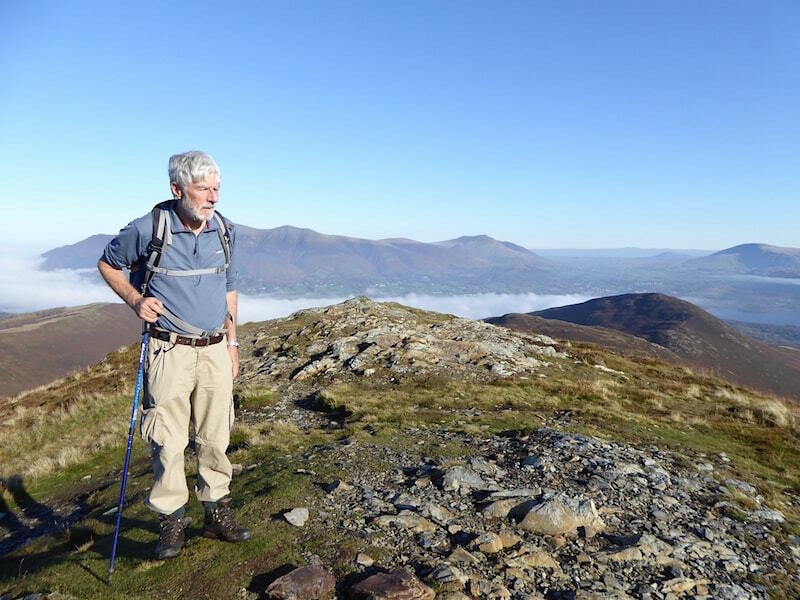 On Outerside summit with a view of the northern fells again. 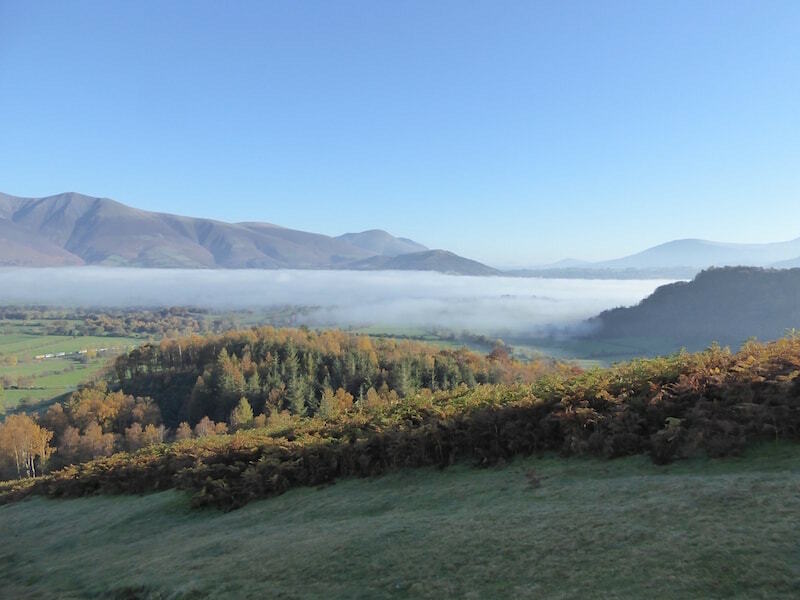 The inversion, coming in from Bass Lake which is under the cloud to the left, has covered the vale of Keswick once more. 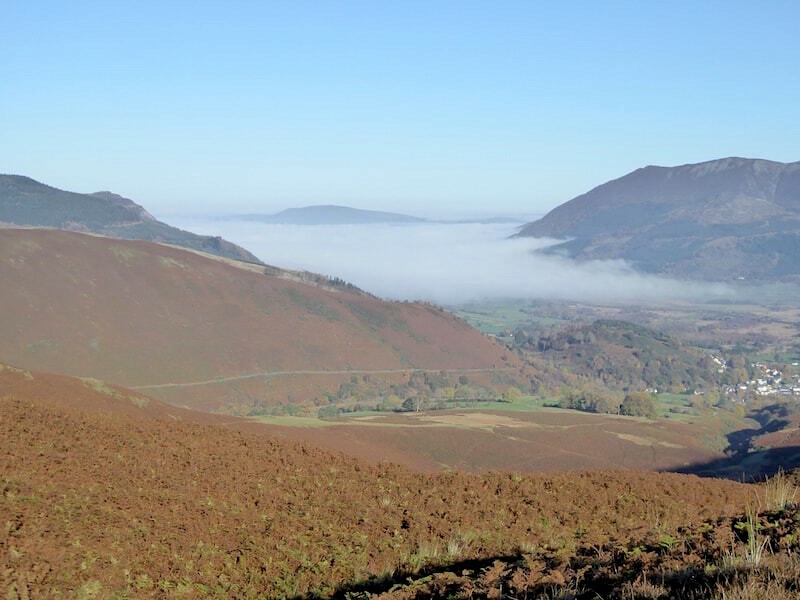 Looking westwards across Kinn, the inversion is beginning to creep up the side of Ullock Pike, and Binsey has all but disappeared. 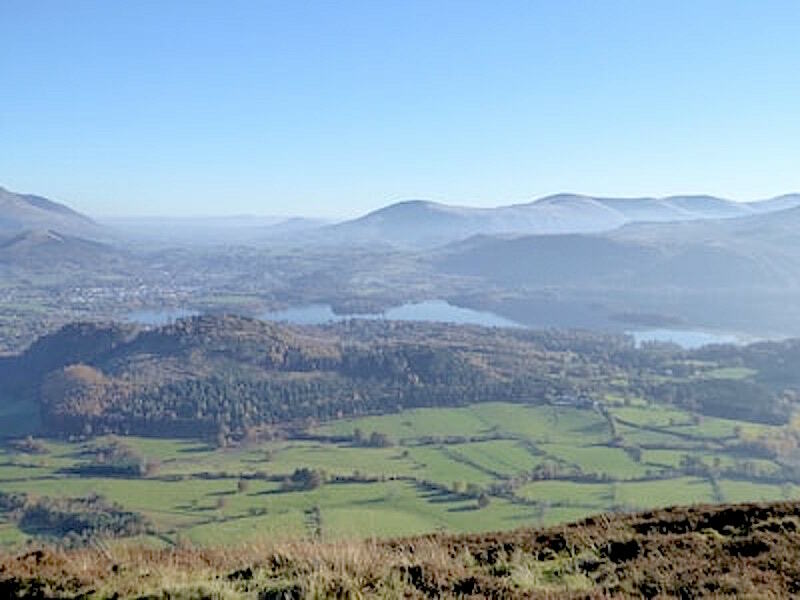 Nature putting on a grand show and we had a grandstand view from Outerside summit. 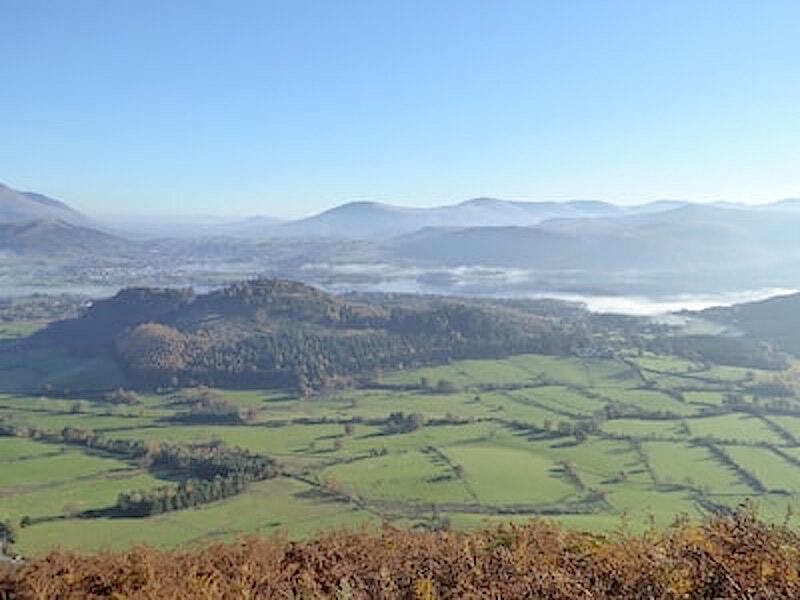 It was very warm up here today, you wouldn’t think it was 2nd November, would you? 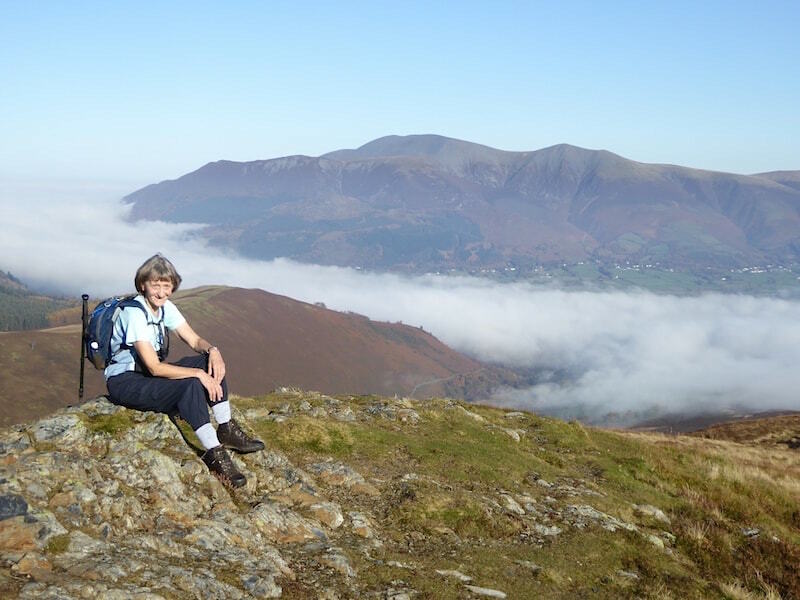 The fell in shade on the left is Crag Hill, and just peeping out behind it is Grasmoor. There are just too many strong shadows today to show much in the way of details or features. 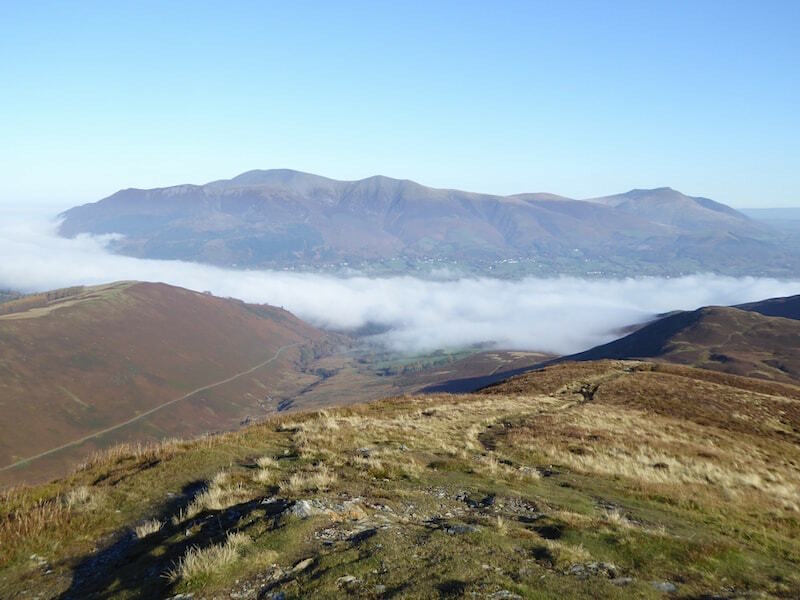 Meanwhile, the inversion behind us continues to spread itself around Keswick. Now its beginning to creep up Stoneycroft Gill. You can just make out the very top of Binsey, over to the left, in all that cloud. 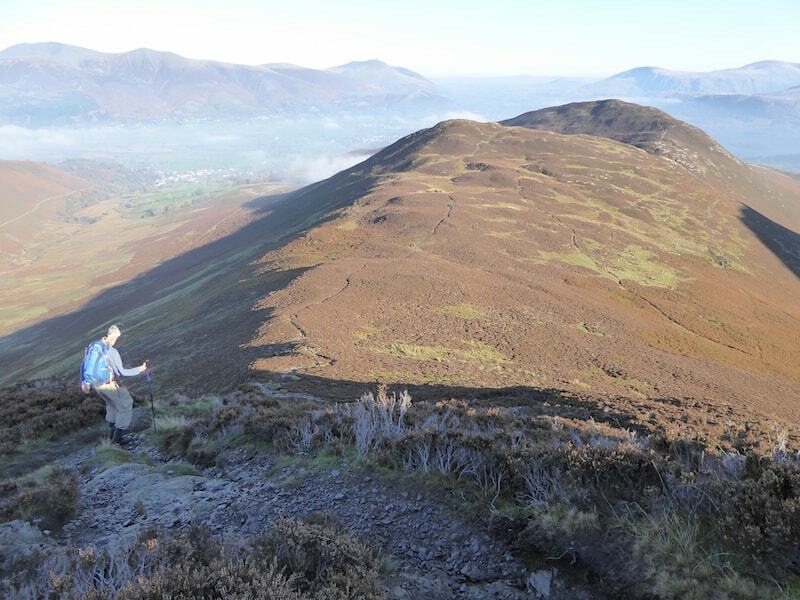 A look down over Scope End and Barrow to check the progress of the inversion. 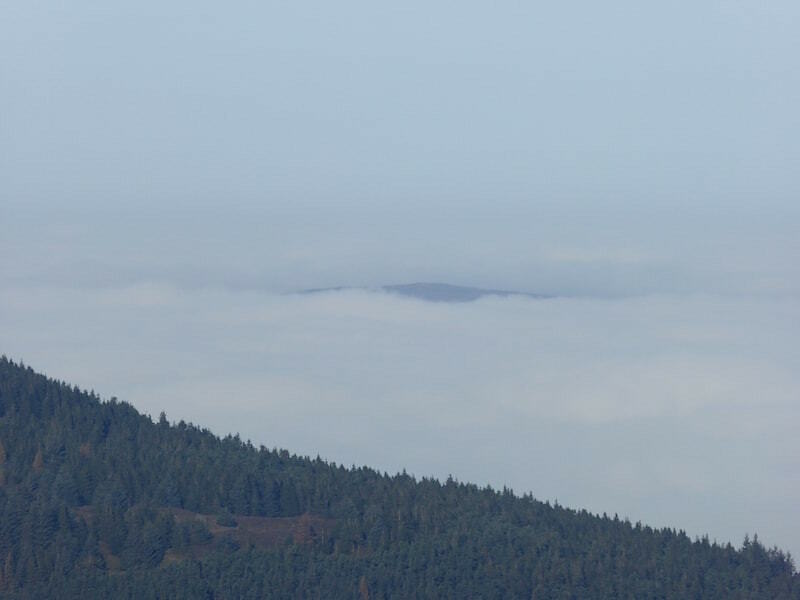 A long zoom over to Binsey, which now looks as if its floating. 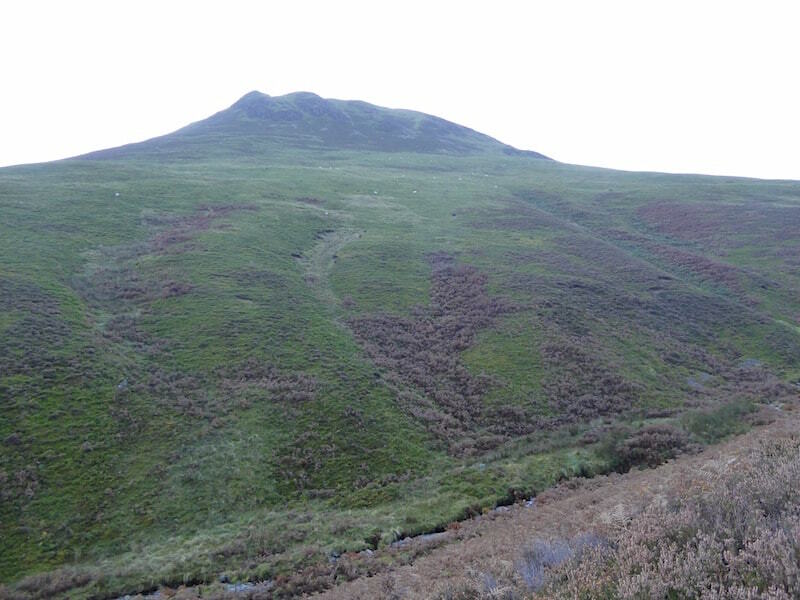 Binsey was the only thing visible in this direction. 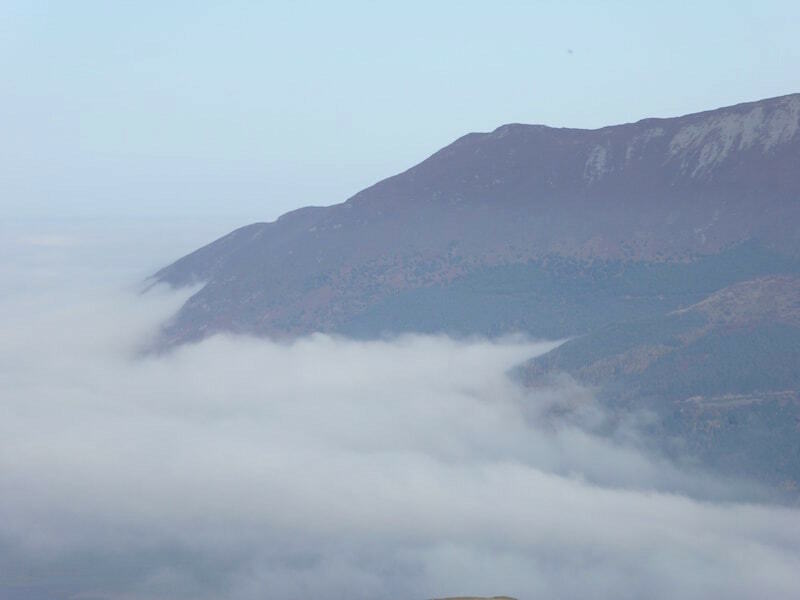 Now a long zoom onto Ullock Pike, the inversion now a good distance up the fell side. 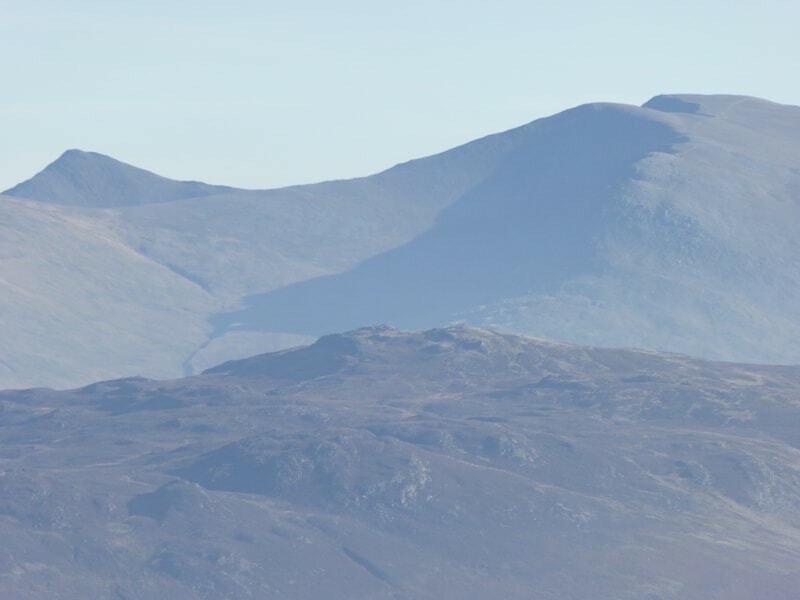 Another long zoom over to Catstycam, on the left skyline, and Helvellyn, over on the right. 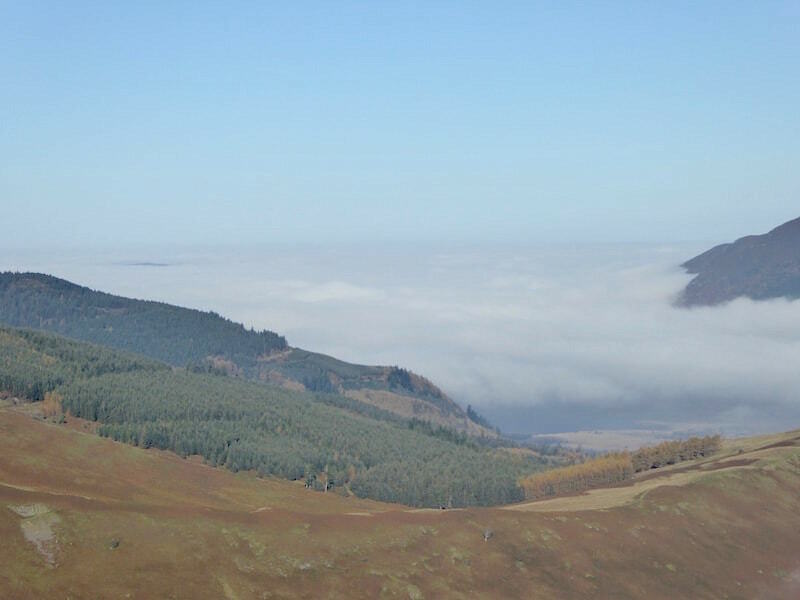 No inversion across there just the general haze. 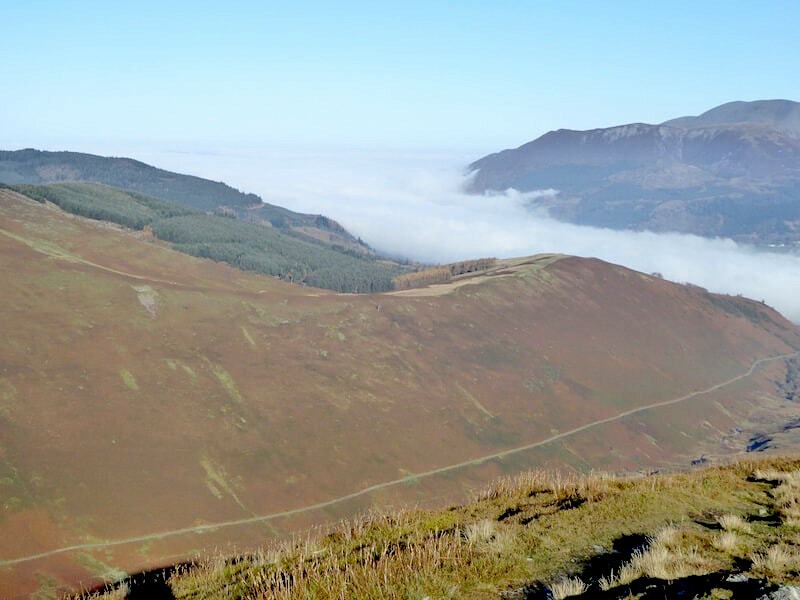 Time to make our way down so that’s the end of inversion gazing for today. 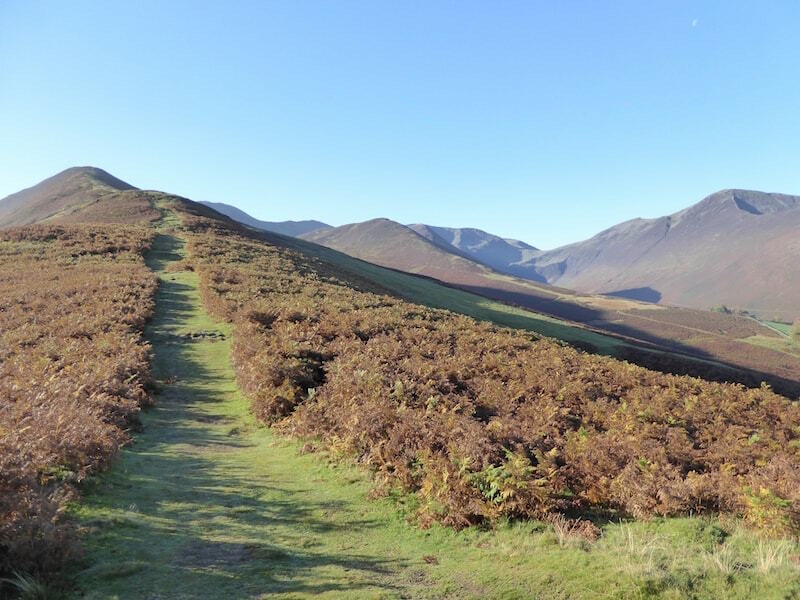 From the Stoneycroft Gill path a view up Causey Pike. This side of the fell stayed in shade all day now that the sun doesn’t get very high. 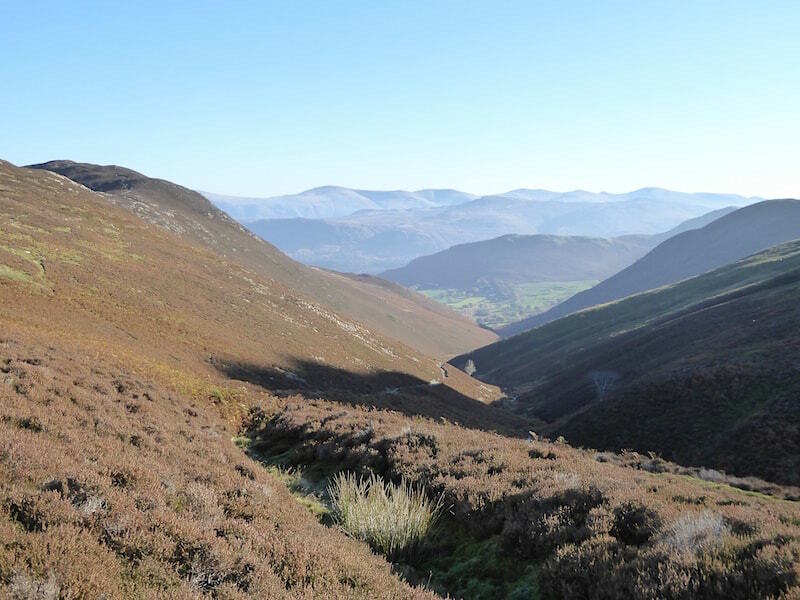 Looking down Stoneycroft Gill across to the eastern fells. 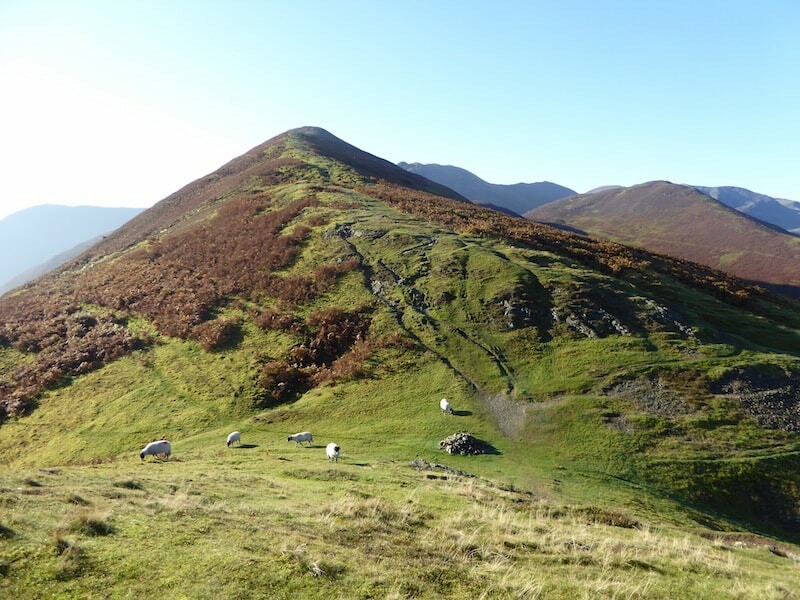 A view of Catbells over Stoneycroft as we reach the valley bottom. 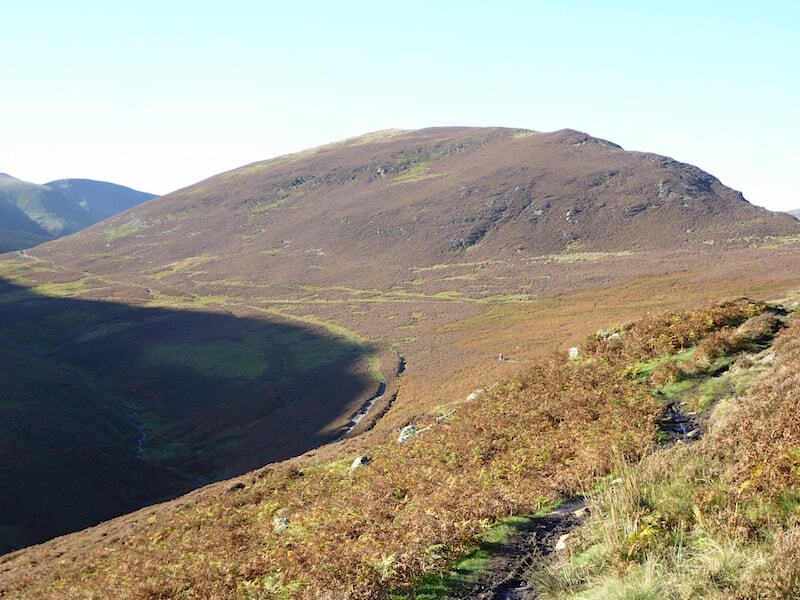 Looking over to Swinside Knott. 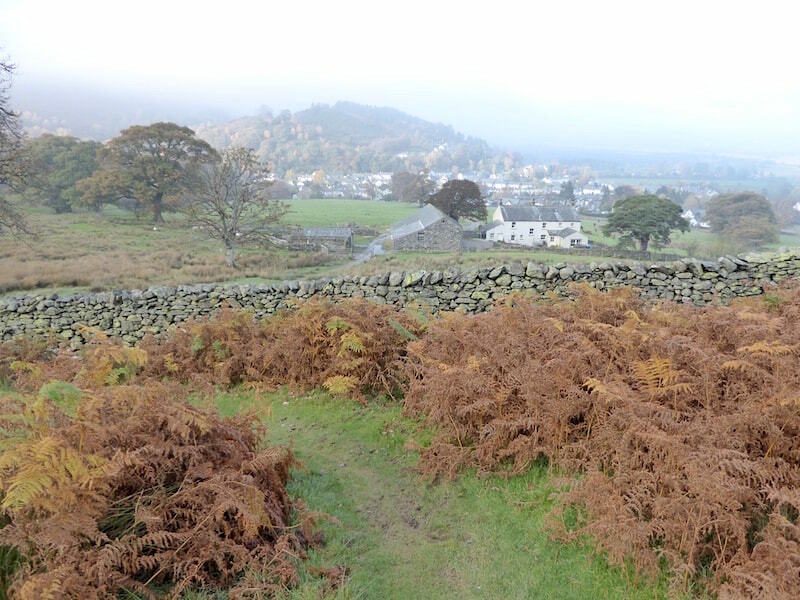 We left the road walking section at this point to take the path back to Braithwaite. 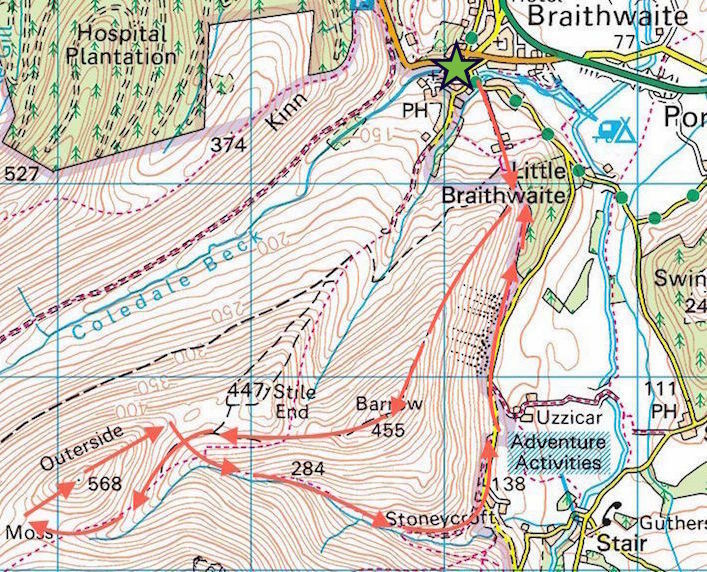 One more hillside to climb and then it’ll be downhill all the way to Braithwaite. Not far to go now. 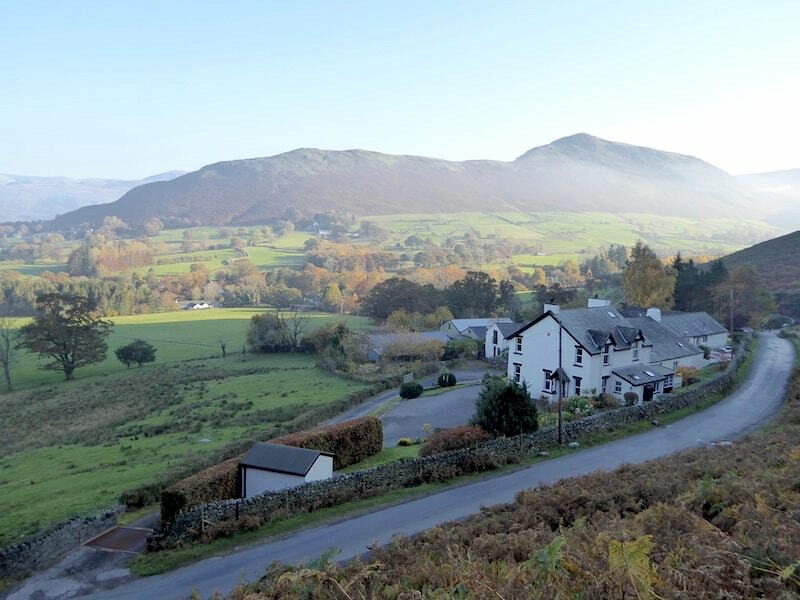 That’s Braithwaite village, where we started from, so that’s the end of our walk. 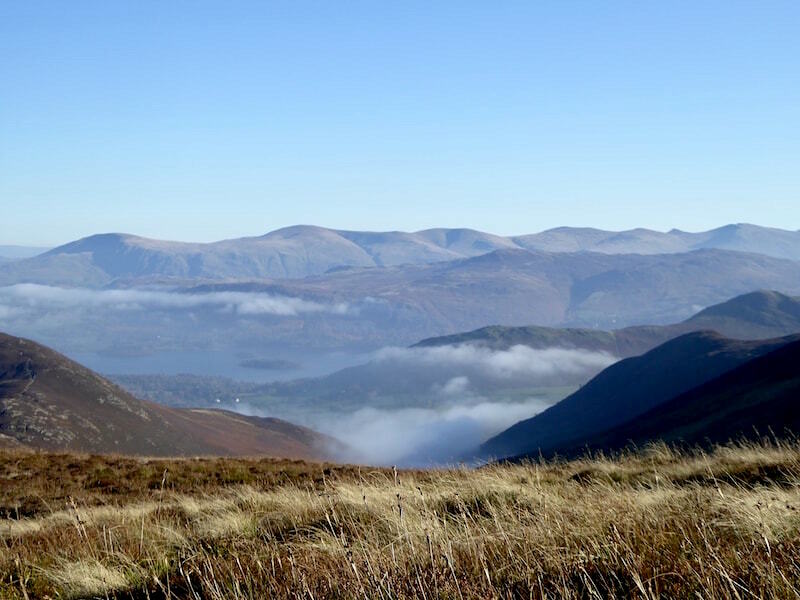 Only a short trip today now that the daylight hours are dwindling, but a very enjoyable one nevertheless especially as we weren’t expecting to see an inversion.